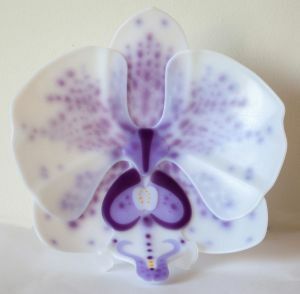 Fused and kiln formed glass moth orchid. Layered glass petals with flame worked detail. Kiln formed to recreate the living structure. Suffolk glass artist, Laura Hart, creates fine art glass sculpture and functional glass tableware from her studio in rural Cavendish. She specialises in fused and kiln formed glass orchids, glass wild flowers and meticulously detailed fused and cast glass butterflies; uniting several traditional glass making techniques with the addition of sterling silver for anatomical detail.